Israeli border police officers stand near the Dome of the Rock Mosque in the Al-Aqsa Mosque compound in Jerusalem's Old City, July 27. The Netanyahu government pushed the limits of the status quo of both Jerusalem and the Al-Aqsa Mosque compound with new settlements in East Jerusalem and new security measures at the compound. However, thanks to the courage of Palestinian youth's non-violent resistance and internationalization of the issue, the attempt of Netanyahu to change the status quo of the compound was stopped until a possible next attempt. Days after another attempt of the Netanyahu government's occupation ambitions, Palestinians were able to access to the Al-Aqsa Mosque without any extra security measures and restrictions. Nevertheless, last Friday prayer took place on the streets of Jerusalem due to Israel's decision not to let Palestinians who are under 50. As that age restriction gone, Palestinians were free to move into the Al-Aqsa compound without any restriction. On July 27, Palestinians had a rare victory over the Netanyahu government's attempt to change the status quo of the compound. During very early time of the day, Israel decided to remove metal barriers and security cameras outside of the compound, leading Palestinians fill the streets of Jerusalem with joy. However, next two prayers didn't take place inside the mosque until afternoon prayer due to the final assessments of Waqf. Waqf decided that afternoon prayer will be the time for Palestinians to pray inside the mosque. However, another interesting and restrictive attempt actualized. Israel still kept one door called as the Bab al-Hutta closed. At that time Palestinian youth again took the stage and shouted slogans "The Bab al-Hutta still closed we won't enter." It was the time that Palestinian youth decided to enter the mosque after they heard the announcement the Bab al-Hutta opened. But, Israel with stun grenades and rubber bullets begrudged Palestinians minute of peace in the Al-Aqsa compound. That current event is actually a continuum of a type of policy that Israel has implemented since 1967. East Jerusalem, the Old City, including holy cites, were ruled by Jordan from 1948 to 1967, and the Al-Aqsa compound was administered by the Jordanian Islamic Waqf. During that time non-Muslim visitors were permitted to enter, but non-Muslim prayer was forbidden. 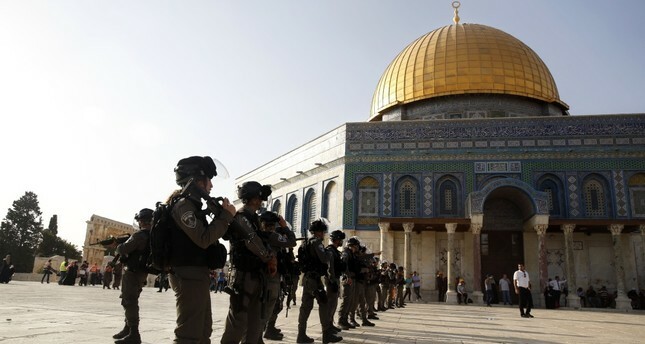 However, following the 1967 occupation, Jerusalem was occupied and unilaterally annexed by Israel, in an acquisition of territory by force that is prohibited under international law, as the first step of Israel's gradual conquest of Jerusalem and particularly the Al-Aqsa compound. In that sense, it is important to mention Israel's tactic for gradual conquest. Israel is not occupying Palestinian places that Israel considers holy only for Jews in one go, but implementing gradual tactics calculating regional and international political balances. But before implementing gradual tactics, it is Israel's vision to create and escalate a situation of instability, insecurity and violence that immediately turns into a new status quo. Following the occupation, Israel continued its de-Arabization policy that started in 1948 and reached its peak in 1967. After Jerusalem's occupation, Israel immediately demolished the Harat al-Magharibah (the Moroccan Quarter), which was built 700 years ago during the era of the Ayyubids and Mamluks, compatible with Israeli Zionist exclusionary vision stating Jerusalem its eternal and unified capital. Some 650 people and 100 families who were the real inhabitants of the Moroccan Quarter who were ethnically cleansed by Israel and Western Wall Plaza was built over the occupied Moroccan Quarter for Jewish worshippers. At the same time, then Israeli Defense Minister Moshe Dayan let the Waqf administer the Al-Aqsa compound while Israel was in charge of security to avoid any major conflagration with the Islamic world in line with Israel's gradual conquest tactic. However, it was not enough to protect the gain of occupation at that time. Israel had to reconfigure the Moroccan Quarter. Following the weeks of 1967 occupation of Jerusalem, Jewish worshippers walked toward the Western Wall among the ruins of the Moroccan Quarter razed by Israeli forces. After enough worshippers as human resources for legalization of illegal occupation came to the area, Israel enacted the 1967 Protection of Holy Places Law that was signed by Prime Minister Levi Eshkol along with the minister of religious affairs, President Zalman Shazar. The law states: "The Holy Places shall be protected from desecration and any other violation and from anything likely to violate the freedom of access of the members of the different religions to the places sacred to them or their feelings with regard to those places," and aims to protect the Western Wall Plaza as plunder of the occupation. The Ibrahimi Mosque compound has also been one of the major scenes of the Israeli occupation due to the Jewish belief that Abraham, Isaac, Josef are their ancestor and their tombs lay there, giving the name of the place for Jews, the Cave of the Patriarchs. During the 1990s, Jewish settlers began visiting the mosque in large numbers, which led clashes between Palestinians and Jewish settlers. On Feb. 25, 1994, an American born Jewish settler, Baruch Goldstein, illegally entered the mosque, sprayed bullets and massacred 29 Palestinians in the Ibrahimi Mosque during Friday prayers. Following that event, even though the Israeli government condemned the attack, it did not miss the opportunity. Israel split the site into separate sections for Muslims and Jews in an arrangement that is still active now. In addition to that, despite the fact that terrorism came from Jewish settlers, the main access streets to the mosque are reserved for only Jewish settlers due to so-called security reasons.